Today’s games industry has become infamous for its endless copycat efforts and yearly sequels, which tend to stick to a very specific template and only offer a modicum of improvement. Nevertheless, while it’s easy for us to call out these games for their lack of innovation (only for us to all then go and buy them anyway), it doesn't mean that we can’t still find enjoyment in them. Kung Fu Rabbit from Neko Entertainment falls into this category. Pushing the rabbits and ninja aesthetics to one side for a moment, it’s very clear that this game is heavily influenced by indie classic Super Meat Boy. There's no denying that the gameplay style is remarkably similar, and it even incorporates the same wall jumping mechanics. Yes, it may not sound like the most inspiring game ever released, but Neko Entertainment hasn't just created a shameless rip-off. Rather, Kung Fu Rabbit draws on what made its likely source of inspiration so great and tries to provide a slightly different experience which is both well made and worth considering, if you like this style of game. 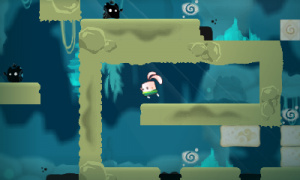 In this 2D sidescroller, you must ninja your way through a wealth of short stages, jumping between platforms, avoiding hazards and collecting carrots along the way. While not overly sadistic, Kung Fu Rabbit does nevertheless get quite tricky as you progress and demands exceptional precision and timing if you want to beat it. As we've already highlighted, Kung Fu Rabbit doesn't offer anything new when it comes to its core mechanics, but that doesn't mean it isn't still fun to play. Overall, the level design is solid and to the point where it never gets in the way; if you mess up, it’s always your own fault. Moreover, it controls well, enabling you to achieve the level of precision that is required for some of the game’s trickier parts. The fact that Kung Fu Rabbit uses such a simplistic control setup is what makes it so successful, with you only ever having to use a single button through its entirety. Kung Fu Rabbit will likely appeal to those who enjoy a good challenge, but thankfully it does include a few gameplay features to help out lesser skilled players. An in-game shop, which allows you to spend the carrots you find in each of the game’s stages, provides a number of useful items to aid you in your quest such as the ability to designate a respawn point should you die or even remove all enemies from the stage. The system achieves a nice balance in terms of difficulty and rewards effort instead of spoon-feeding you instant success. 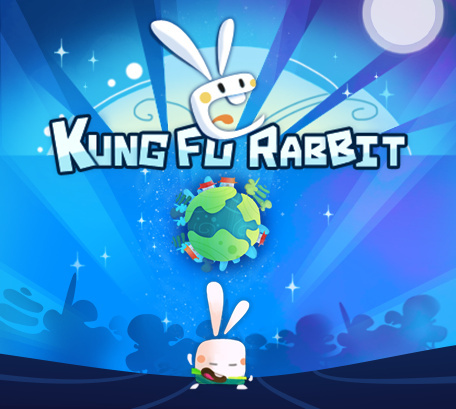 This is all presented in a very charming and light-hearted manner; from the silly little animations to the rather humorous loading screen messages, Kung Fu Rabbit looks and feels as fun as it is to play. The feudal Japanese settings are vibrant and colourful, and the visuals are sufficiently sharp for the relatively small 3DS screen. 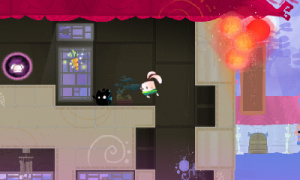 You may recall that Kung Fu Rabbit has already been released on Wii U. Is there a definitive version? Well, not really — it’s more a case of what your preference is when it comes to screen resolution or portability. Kung Fu Rabbit won’t blow you away with new gameplay innovations and cutting edge design, but it is nevertheless a fun game to play. More importantly, it’s well made, sporting finely tuned controls, stylish visuals and a good amount of challenge. It's well suited to the 3DS and while it may lack the high definition offered by its Wii U counterpart, it's not a huge loss as the beauty is really found in its art style. With lots of short stages, it’s a great pick-up-and-play title, making it a positive purchase for 3DS owners who take their system with them on the go. Is there as much to it as Super Meat Boy ? (Getting the proper ending on that is a reasonable amount of content I think). Is it like Super Meat Boy without the run button held down ? (That is too slow for me). It also has plenty of different mechanics via the characters you can unlock. A good and challenging game, I played on Vita and 100% is tough but fun to do, I recommend, special to who likes platformers. I would rather get the Wii U version. Big screen, points for Deluxe Promo, for the same price. If you do decide to get this game, definitely go with the HD visuals of the Wii U. This 3DS port doesn't use 3D in anyway, despite the fact that the levels are so well suited for it. This game kinda looks like Super Little Acorns 3D Turbo to me. 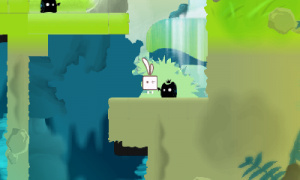 Can anyone tell me if it plays / handles the same or very similar, cause I really enjoyed Super Little Acorns, but I'm more of a simple platformer, point A to B type of player (as this game seems to be), since Acorns was a bit more on the unique and creative side for the most part. I mainly really love the charming aesthetics and tight controls of Acorns, and from the looks of it, this game seems to look quite similar. Does it also have similarly tight controls, if anyone knows? Wait, the game does NOT use 3D at all???? That's why I really wish the screenshots were viewable in 3D for ALL of the 3DS games that utilize the 3D effect (like 95% of the 3DS eShop games). I don't understand why it's been years and still only a minority of the games properly display their screenshots in 3D! Although that doesn't really apply to this game (since it's all 2D), if they simply fixed the three screenshots in each games' descriptions to look 3D like they do in the actual game - people would know, by the lack of 3D in the screenshots, when a game like this or Crazy Construction disregards the 3D capabilities entirely. How the games look in 3D and how well it's implemented is important to lots of people, and can definitely affect their decision on whether or not to make a purchase - especially with the higher-priced games. I have this for the Wii U, and sadly it isn't very good. A mobile game through and through, in the bad meaning of the expression. @ricklongo what exactly is the bad meaning of the expression? Because a bad mobile game to me would be one with poor controls, in-app purchases and lots grinding to reach milestones. Kung Fu Rabbit has none of these. Well, Kung Fu Rabbit does repeatedly prompt you to buy powerups from the dojo with carrots - it carries over from the mobile release, and feels unnecessary. I don't need to be told after each level, particularly early on when powerups aren't even needed to make progress. Some may think it a minor annoyance, and perhaps it is ultimately. But it screams mobile port through and through. @MegaWatts What I meant is that I found it shallow, with next to none truly satisfying momens. All in all, a simple time killer that won't ever get you invested. Maybe "bad" was a harsh word. More like mediocre. EDIT: Oh, and the controls are pretty poor, at least in my opinion. Super floaty physics are a pet peeve of mine. No 3d means no buy for me.